Djibouti is more of a wasteland, but do not let that discourage you from taking a trip there. This African country has some scenery that will leave you in awe. The coasts are very beautiful, and you can travel to Lac Assal, which is the second lowest point on Earth. Plus, on the way there, you will be able to see the Devil’s Island, which provides fantastic scenery. When you are not exploring, you can go to one of the various coasts. The climate may be arid, but the coasts have many reefs that wait to be explored. Just rent a kayak and paddle for hours before you find a lovely place to snorkel and enjoy the beach. Before you go to Djibouti, there are some things regarding the visa that you should know. First of all, according to Djibouti’s visa policy, very few people can enter without a visa. We are talking about the citizens of Singapore and China. However, the rest of the nationalities can go for a visa on arrival once they reach Djibouti, or they can get a visa at the nearest embassy of Djibouti. At the same time, the government of Djibouti introduced the electronic visa system on 18th of February 2018. It was meant to replace the visa on arrival. The measure was a success since everyone who travels to Djibouti prefers to apply online than standing in line at the visa on arrival counter or go to the embassy. 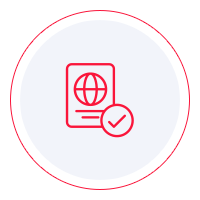 If, however, you want to go to the embassy and submit an application for your visa there, our Visa Checker can provide a list of the nearest embassies. Just choose your nationality from the drag-down menu and put Djibouti as your destination. You will be given a list of the embassies you can use to apply. Unfortunately, iVisa does not process visa applications for Djibouti at the moment, but that will change in the future. We are making all the necessary preparations. However, we still want to help in the meantime. That is why our support service is available to you 24/7 and is entirely free of charge. As far as the requirements are concerned, you have nothing to worry about. If you apply for your visa at the embassy, you can read about the online, although we recommend that you call the embassy itself and ask your questions there. The internet may be full of information, but not all of it is reliable. However, what you need for sure is a passport that remains valid for at least another 6 months from the date of arrival in Djibouti and a return or onward flight ticket. You must also provide proof of accommodation. Other than that, you just need to fill in the application and wait for a few days. We regret that we cannot help you get your Djibouti e-visa at the moment, but we guarantee that that will change soon. In the meantime, we hope that you find the information above somewhat useful. If not, feel free to contact us if you have more questions.